The number of internet-connected devices is expected to reach 34 billion by 2020 – up from just 10 billion in 2015. The interconnection of these devices is called the Internet of Things (IoT), and this network has the ability to collect, analyze and share useful data about our lives, allowing “things” like smart thermostats or smart watches to learn and adapt to our preferences. This emerging smart network is predicted to revolutionize how you interact with the world around you in nearly all aspects of your life – from managing your health to how you get to school or work – but many of the most exciting applications of IoT (and many of those that are the most impactful for the future of our society) are in how we power our homes and communities. Today, with the help of connected devices, you now have more control over your own home energy consumption than ever before. By using a smart thermostat, like the ones offered by Nest and ecobee, you can potentially save 15 percent or more on your annual energy costs by having the device optimize your home’s heating and cooling based on the weather, your preferences and the price of electricity at various times of the day. For some people, however, a smart thermostat is just the starting point for making their home smarter, more comfortable and more efficient. Several companies today (Samsung and Wink among them) are offering home automation systems as a centralized hub that brings together all of your other smart devices, including appliances (like dishwashers, refrigerators and washing machines), lighting, automated window blinds and even non-energy devices like smart home security cameras and door locks. Used together and managed by a central system, these appliances and home improvements can amplify the benefits to you – both in energy reduction and, eventually, cost savings. In addition to the potential energy savings, the smart home offers other benefits from tech like smart monitoring products that allow you to view your home’s carbon monoxide level even when you’re away or the ability to get hands-free information from a Google Home or Amazon Alexa voice assistant. With smart home tech, you have unprecedented control of your home’s energy usage – and also the ability to improve your home’s comfort, safety and security. But the inside of the home is not the only place IoT is changing your environment and your relationship with energy. Outside your home, IoT is revolutionizing how we interact with our local communities by increasing the efficiency of many municipal services and improving how power is distributed throughout the community. 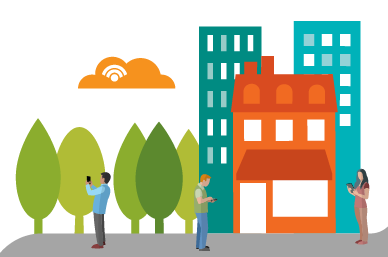 The connection of these technologies through your local area is called the smart city and can include anything from public transportation software, which can streamline city transportation services, to solar-powered benches, which can you provide you with respite from the city bustle while also allowing you to charge your smartphone and connect to WiFi. Smart cities applications also include things like smart garbage bins, which can communicate to waste management services when they’re full, keeping the city cleaner and improving the efficiency of city workers. And one of the most popular applications in recent years has been smart streetlights. A variety of cities are already using energy-efficient, LED streetlights that can reduce energy usage by up to 70 percent by automatically adjusting brightness depending on the level of nearby activity. IoT is also revolutionizing how power is delivered from a power plant and used throughout your community. And the integration of sensors and other connected devices to the power grid, creating what’s known as a “smart grid”, is already creating numerous benefits to our society, including quicker power restoration after major storms and more efficient integration of green energy sources, like wind and solar. The smart grid is foundational to the smart city and essential in creating more livable, efficient cities in the future. 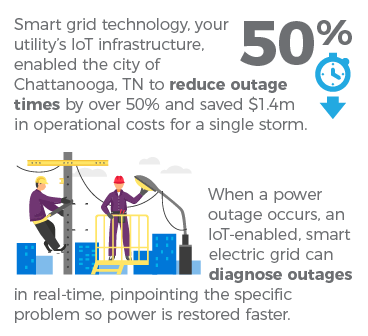 In Chattanooga, Tennessee, for example, the city implemented smart grid technology and has reduced outage times by over 50 percent, saving over $1.4 million in operations costs during a single storm. The implementation of a smart grid, coupled with high-speed internet infrastructure, has provided a significant economic boost to the city. In other major urban areas, smart grids are allowing residents to more easily participate in rooftop or community solar power and battery storage, contributing to greener, cleaner cities that use less smog-creating fossil fuels. IoT technology and smart grids are also allowing easier integration of electric vehicle (EV) charging stations around cities and enabling you to potentially receive open charger notifications on your smartphone. Back at your smart home, IoT allows you to charge your EV at times when the price of electricity is at its lowest. There is an abundance of possibilities for IoT technology in energy, and ultimately, this means more convenience in your life. Whether in your home, around your neighborhood or throughout your local community, IoT will take your relationship with power to the next level, empowering you to make better choices for yourself, your family and your home. To learn more about how the Internet of Things is changing the world of energy, view or download our new infographic here.